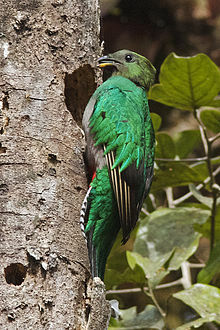 The resplendent quetzal (Pharomachrus mocino) is a bird from Central America. It is well known for its colorful plumage. It plays an important role in Mesoamerican mythology. The resplendent quetzal is the national bird of Guatemala. It is represented on the country's flag and coat of arms. It is also the name of its local currency. ↑ BirdLife International (2012). "Pharomachrus mocinno". IUCN Red List of Threatened Species. Version 2013.2. International Union for Conservation of Nature. Retrieved 26 November 2013. This page was last changed on 25 October 2018, at 12:17.